Travelling is many things: an incredible adventure, and an invaluable education, a journey into yourself, and so forth. But after having been shouted at by a taxi driver in Istanbul who apparently hated nothing more than being paid, I have realised that it’s not relaxing. If anything, travelling is extremely stressful. Booking flights, finding accommodation, figuring out whether you are being charged honest prices or not, winning the fight with the taxi driver… Surely it doesn’t have to be this tricky all the time? Well now there are a plethora of travel apps designed to fill in this gap made by inconvenience and occasional confusion, but which ones are actually worth using? This is an incredible resource to use while travelling, it hosts an enormous database of user reviews from all over the world for restaurants, activities, hotels, and even a facility to book both flights and accommodation. It also has a neat “Near Me Now” function which brings up all this information for everything within a certain distance from you. You can also keep track of all your bookings made with the app. And if you’re going to be without internet for a while, you can download information packs for cities or areas before you leave, so that you have all this information offline if you need it. Get it for Android and iOS here. Hopper is great for getting the cheapest possible prices for your flights. 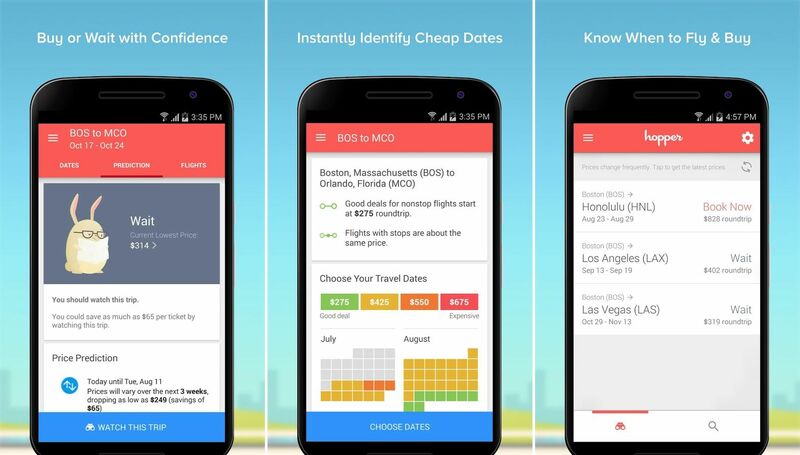 A colour coded calendar lets you know what dates have the best prices for a certain route, and once you have set your dates, Hopper watches that route, telling you if you have a good deal or not, predicting what will happen to the price if you wait, and alerting you if the price gets as good as it ever will. You can also book the ticket straight from the app. If you’re travelling to a country that doesn’t speak your native language, Google Translate is a must-have. Able to translate text, images, handwriting, and even speech between over 75 languages, it will come to the rescue time and again. 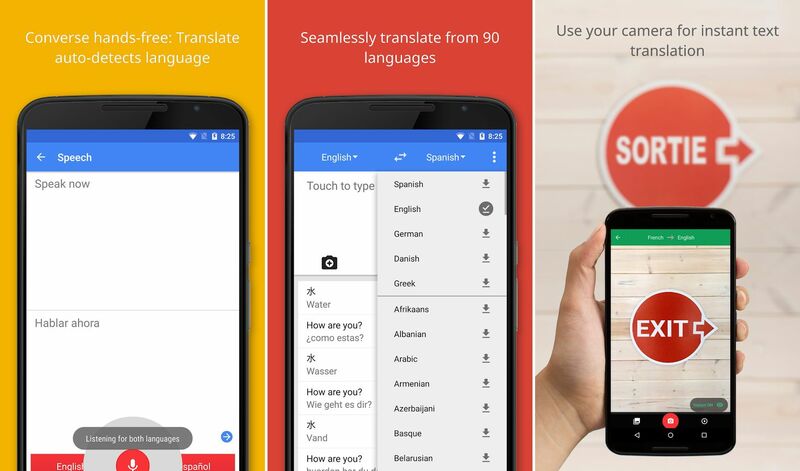 You can save commonly used phrases into a phrasebook, so that you can quickly translate them into the selected language without having to type them out each time you use them. But perhaps its most spectacular feature is the conversation mode. Select which languages you will be translating between, and start talking. It will translate your speech out loud as you talk, and translate the other person’s language back into your language as they speak. Fair warning though, it needs to be able to hear you clearly in order to get it right, and even then the translation won’t be perfect. But if it can hear you both clearly, it’ll get the message across. 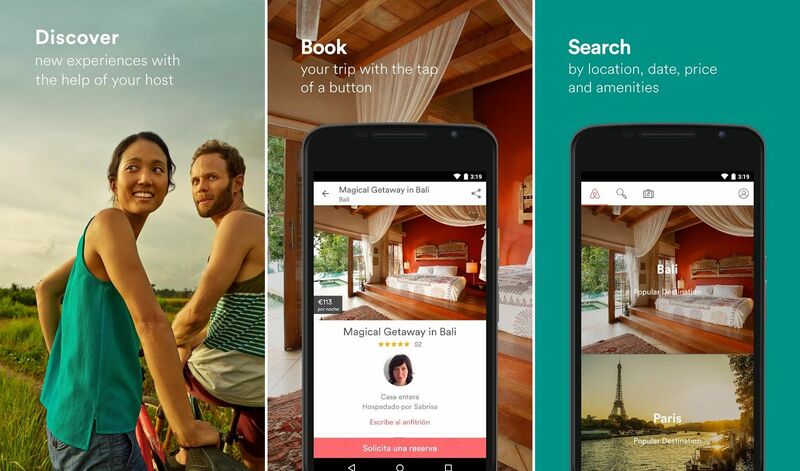 Airbnb is an extremely useful way to find accommodation quickly, cheaply, and easily, practically anywhere in the world. Making a booking is incredibly easy, and it even puts you in touch with your host through the app. All hosts are verified by Airbnb and are good quality, and reliable. Keeping track of your booked accommodation, flights, activities and so forth can be frustrating to handle, each one with its own confirmation email buried deep inside your email, impossible to find when you need to quickly remind yourself what time your hot air balloon ride starts. TripIt is the perfect solution, by combining and sorting all your bookings and keeping them in one place for you to quickly access. If you use either Gmail or Google Inbox, it does this automatically by scanning your email for any bookings you make. If you don’t, you can simply forward all relevant emails to the app, or add bookings manually if you didn’t get a confirmation email, or if it’s something that’s important to your itinerary, but doesn’t get booked, such as visiting a game park. 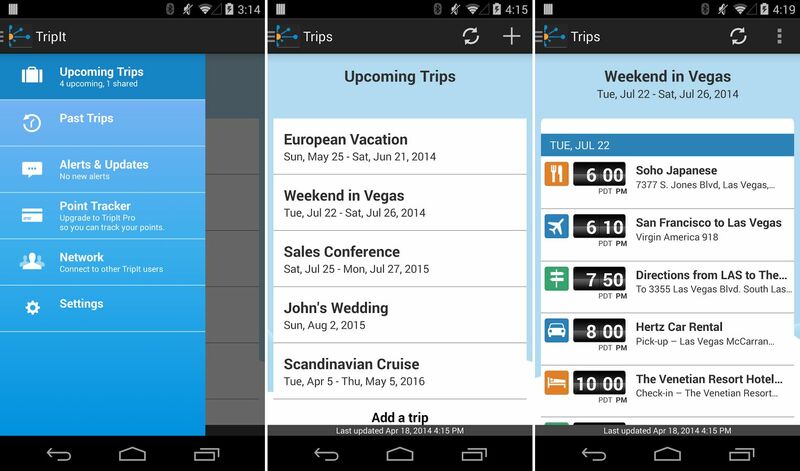 The app also finds directions to each destination, and it synchronises all of this information with the TripIt website, as well as your Outlook, or Google Calendar. 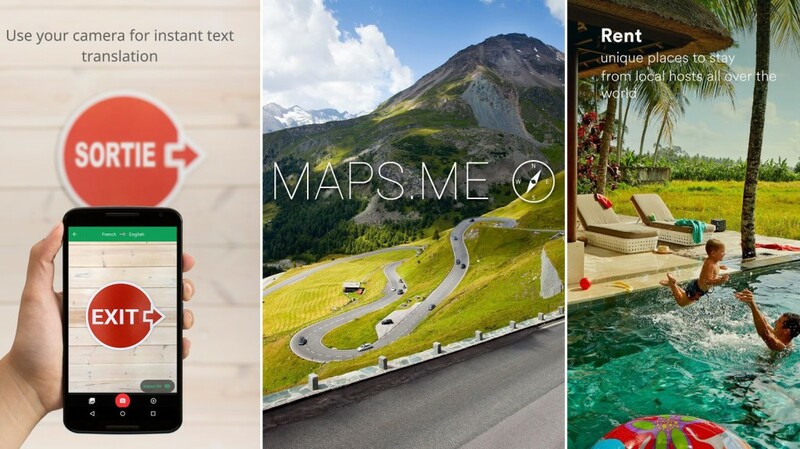 Maps.me is the perfect answer to the data intensive Google Maps. 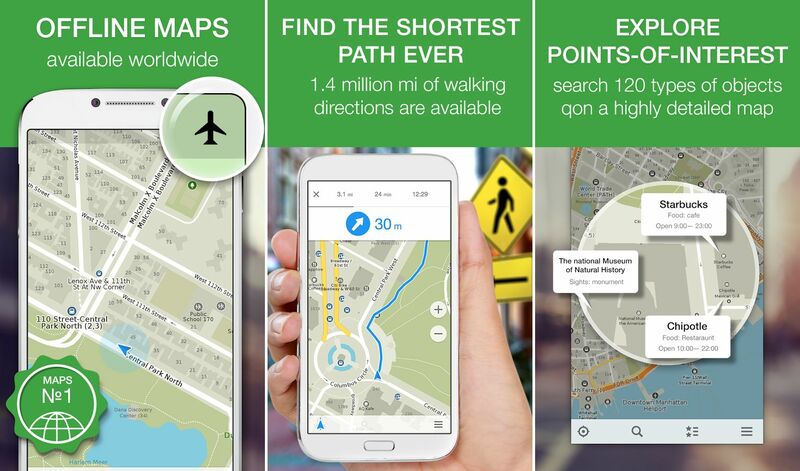 This app works by allowing you to download maps of cities or areas that are then available offline. 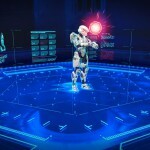 They can also be downloaded with navigation data, so that you can find your way around without spending a cent of data. The maps also contain tons of useful data such as ATM’s and gas stations. The app itself claims not to use much space on your device due to the compression technology that it uses, however some caution should still be exercised, obviously the more you download the bigger it will get. This also applies to your data bill, this app is designed for you to download the maps you need, preferably on WiFi, before you set out. 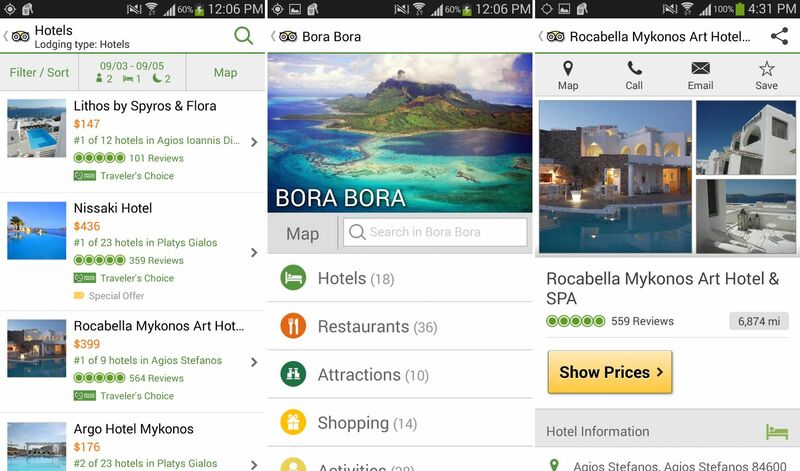 Some of these apps have overlapping functions, such as TripAdvisor keeping track of some bookings that TripIt will also keep track of, so it’s up to you to decide which ones work best for you. All these apps are available for free, for both Android and iOS devices as stated, and if you have any more that you love to keep on your travel device, let us know in the comments section below.